This issue may occur when installing PROS from within the Atom GUI. The current cause of the issue is unknown. You can get the dependency installed by manually installing platformio-ide-terminal by going to settings (Ctrl + ,), click Install, then search for and install platformio-ide-terminal. In some instances, restarting Atom will allow the plugin to install. The easiest solution to this issue is to upgrade to 16.04 LTS. During normal operation of the serial COM ports on windows errors may occur when hardware is disconnected causing them to not close. This results in high COM port numbers (e.g. COM17). We recommend following these instructions to clean up any COM ports that are left in limbo. Diagram courtesy of VEX Robotics. 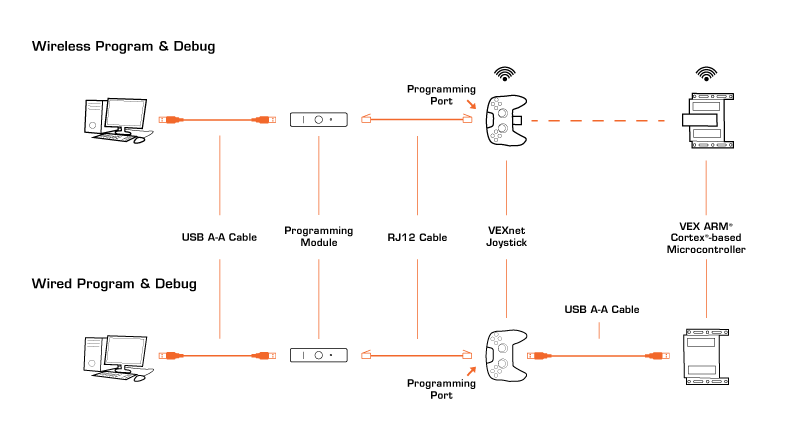 Both wired and wireless (VEXnet 1.0 & 2.0) are supported. After updating Atom to a new minor version, some packages (including platformio-ide-terminal) will not work until they have been rebuilt for the new Atom version. Symptoms include missing terminal buttons and an inability to open the terminal manually using PROS:Toggle-Terminal. If these symptoms apply, check if there is a red bug icon in the right-hand corner of the bottom status bar. If so, click this icon, and you will be prompted to rebuild any broken packages. For more information, see this section of the Atom flight manual.